The deal agreed between Theresa May’s government and the EU has been hailed a good one for Ireland, offering crucial guarantees on a backstop that would prevent such hard border on the island. However, the numbers currently don’t look good for the deal to be ratified by parliament as the crucial House of Commons vote looms on Tuesday. 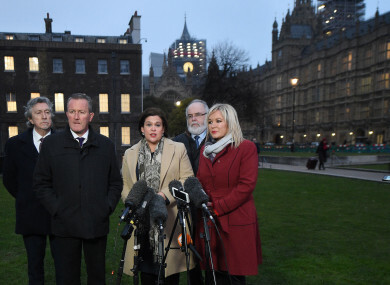 According to a poll for RTÉ’s Claire Byrne Live/TheJournal.ie by Amarách Research, 57% of people said they think Sinn Féin MPs should take their seats in Westminster so they can vote for May’s Brexit deal. Of the 1,000+ Irish adults surveyed for the poll, 20% said the MPs shouldn’t, while 23% said they didn’t know either way. As it stands right now, Theresa May needs all the help she can get. The House of Commons has 650 seats, with four of its members abstaining from voting – the speaker and his three deputies. The Conservative party as it stands does not have a majority in the parliament in Westminster. It has been backed up by the DUP since last year’s general election, as its 10 seats have supplemented the Tories’ 315. It is highly unlikely that the DUP will back the deal. So, on that alone, if all opposition parties voted against the deal – May would lose even if all her party members voted for it. And, again, there’s likely to be a sizeable number of Conservatives voting against the deal. May has been seeking to canvass support throughout the past few weeks, but her position is looking increasingly precarious as the vote looms. Given the current state of the numbers, it is not clear that Sinn Féin could sway the vote with its 7 MPs. Republican abstentionism from elected office stretches back over 100 years. It is just over 30 years ago that Sinn Féin agreed to end its abstentionist policy from the Dáil by 429 votes to 161. The long-standing practice of refusing to take up seats in Westminster continues to this day, with the party running candidates on the clear policy of abstentionism. Voters are made aware that a vote for Sinn Féin in the House of Commons means they’re voting for a candidate who will not take up a seat if elected. All MPs must take an oath to the Queen when taking their seats in Westminster, swearing true allegiance to the monarch. Sinn Féin opts not to do this. Writing in the Guardian in March, Sinn Féin MP Paul Maskey said that sitting in the British parliament is “not what I was elected for”. “We are not British MPs,” he said. “We are Irish MPs and we believe the interests of the Irish people can only be served by democratic institutions on the island of Ireland. Sinn Féin goes to the electorate seeking a mandate for that position. We are elected as MPs who vote for Sinn Féin not to take seats at Westminster. Maskey went on to say that the “people of Ireland will not find a solution to Brexit in the parliament that is imposing it”. In a poll conducted by the same pollsters earlier this year, 67% of people said they thought Sinn Féin MPs should take their seats to vote on Brexit issues. Email “Majority of people think Sinn Féin should take its Westminster seats for crucial Brexit vote”. Feedback on “Majority of people think Sinn Féin should take its Westminster seats for crucial Brexit vote”.